J Jonah Jameson, Aunt May, Flash Thompson, Liz Allen, Betty Brant, B.J Cosmo. 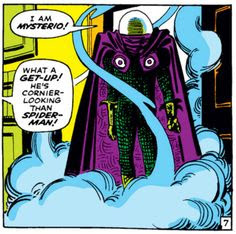 B.J Cosmo (or another director with the same initials) has previously appeared in Journey into Mystery #92, when he hires Thor to provide special effects for his Viking movie. “Creature from the Black Lagoon” came out in 1954 and spawned two sequels “Revenge of the Creature” and “The Creature Walks Among us”. Unlike Cosmo’s “The Nameless Thing From the Black Lagoon in the Murky Swamp”, none of them won any awards. Cosmo doesn’t seem to be aware that Spider-Man had a previous career as a TV performer. The Hulk’s own comic was canceled in March 1963. After various away-fixtures in the Avengers and the Fantastic Four, he returns as Ant Man’s back up feature in Tales to Astonish #59 (September 64), where it is mentioned in passing that he was “last seen in New Mexico”. Peter Parker’s Financial Situation: It appears that both Cosmo and Jameson pay Parker expenses to fly from New York to L.A (about 5 hours), but he chooses to travel back by coach (more like 4 days) to save money. A one way Greyhound from Hollywood to New York would have cost about $50; a flight something around $70, so he’s probably only saving $20. 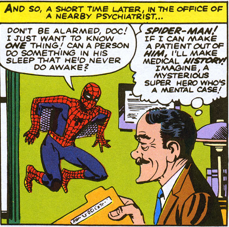 It isn’t clear how he explains the 4 day absence to Jameson, or Aunt May, or Principal Davies; or indeed whether he actually turns in any pictures to J.J.J. $50,000 would have been a fairly small fee if B.J really thinks that Spider-Man is as big a star as Tony Curtis, who could command at last $150,000 per appearance. 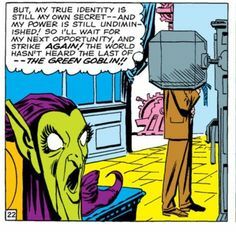 This is not, of course, the plot of the Grotesque Adventure of the Green Goblin; it's my conjecture as to what Stan Lee's original pitch for the story might have looked like. 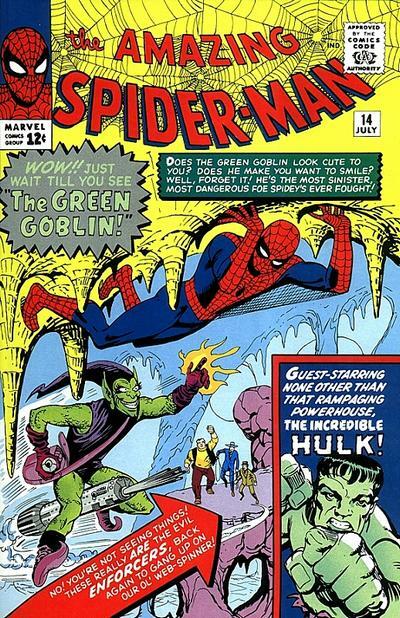 In the published comic, the Green Goblin is involved from the beginning: it's him who persuades B.J. to makes 'The Spider-Man Story' and it's him who persuades Spider-Man to start in it. 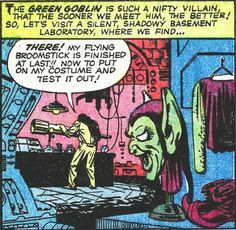 The Goblin isn't a demon, but a gadget powered criminal; and it's a Hulk, not a Goblin, who is discovered in the cave. This is vintage Lee. We dreamed the story up in one go. What you have in front of you is what we always intended to put in front of you. The credits still use the despicable “written by Stan Lee, illustrated by Steve Ditko” formula, but this text comes much close to saying that the comic — the “dreaming up” process, at any rate — was a collaborative effort involving not just Stan, but the whole “gang at the bullpen”. (Who else was in that gang? Martin Goodman? Stan’s brother Larry? Kirby himself?) The dreaming up process can't have been all that onerous for the gang: their big idea is that the issue should involve, er, a new villain (like last issue did and next issue will) and that he should have some henchmen, and that there should be a guest star. I suppose that does pinpoint one unique selling point for the episode: the last three issues have had Spider-Man fighting a single bad guy; but this issue he has to fight five at once. “Stan's synopsis for the Green Goblin had a movie crew, on location, finding an Egyptian-like sarcophagus. Inside was an ancient, mythological demon, the Green Goblin. He naturally came to life. 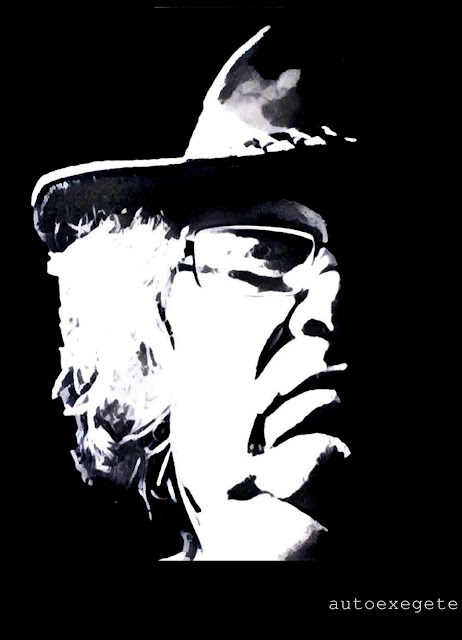 On my own, I changed Stan's mythological demon into a human villain… I rejected Stan's idea because a mythological demon made the whole Peter Parker/Spider-Man world a place where nothing is metaphysically impossible." Stan Lee dreamed up the story; Steve Ditko pretty much ignored it and came up with a different story of his own; and the result was the most famous of all Spider-Man’s enemies. But this bit of Stanish silliness shouldn’t obscure just how well choreographed the fight scene is. Montana — the lasso guy — ensnares Spidery-Man in his rope; Spider-Man pauses, and physically breaks the ropes (taking Montana out of the fight); the super-strong Ox follows through and punches Spider-Man (knocking him down, but not out) while the other two fall on him. Spider-Man again pauses, thinking “I’ve got to summon all my spider-strength NOW…while they least expect it .. While they’re all confused! !” and then throws all three men off him fairly easily. He uses his web to whip up a dust-storm and runs away into a cave: he does not think he can defeat three bad guys at once. They follow him into the cave, and along with the Goblin, block the entrance with a boulder. (The idea of rolling a stone in front of the entrance to a cave calls to mind Don Blake finding Thor’s hammer in Journey into Mystery #83. And possibly other, even holier, stories.) He picks off Montana (who’s acquired a new lasso) and Fancy Dan (the judo guy) by trapping them from above with his webs; he takes the Ox by surprise and knocks him out with a single punch. Suddenly the Goblin reappears and starts throwing stun bombs at Spider-Man: just as we are expecting a final fight with the main villain, but instead, out of the smoke appears the Hulk. 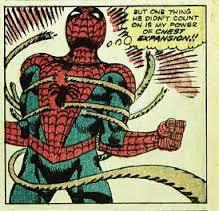 So, it is fairly clear that when Spider-Man refers to "my power of chest expansion" he is simply saying that Montana hasn't realized that he is strong enough to break ropes with his chest muscles — not that he has a specific, never-before mentioned ability to alter the size of his ribs and pecs. 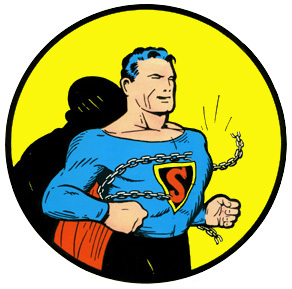 The interesting thing is that he seems to need to pause and focus his mind before doing the rope-breaking trick. Similarly, having been knocked down fairly easily by the Ox, he has to consciously “summons all of his Spider-Strength” before throwing the three guys off him. This appears to confirm that Spider-Man’s power is a supernatural or psychic force which he has to channel; not a physical enhancement. The Ox specifically says that he is surprised that "such a skinny runt" can be so strong. "Even deep in my hidden caves, you attack me! But no-one can capture the Hulk!" "Capture you!? Brother, I don’t even wanna share the same planet with you!" It is perhaps deliberate that we see two punches from the Ox knock Spider-Man down but fail to knock him out. When Spider-Man finally gets a good punch in against the Ox, he renders him instantly unconscious. (Spider-Man uses the rather dubious expression “love-tap”, implying he isn’t hitting him as hard as he could.) But when Spider-Man punches the Hulk, he hardly notices, and Spider-Man actually injures his fist! 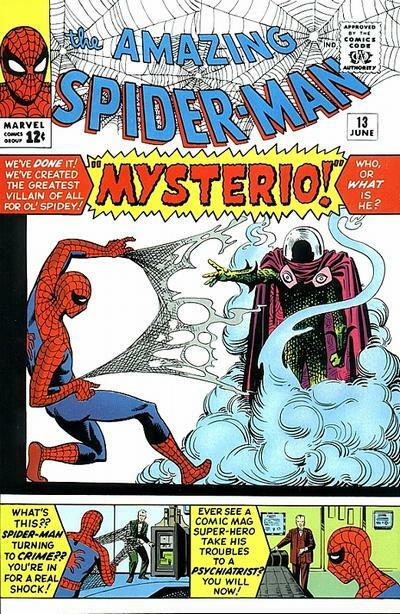 3: Persuade Cosmo to hire him, the Green Goblin, to appear in the film as himself. 4: Persaude Cosmo that the Enforcers are merely actors dressed up to look like the Enforcers. 6: Travel back to Hollywood with Cosmo, Spider-Man and the Enforcers. 7: Wait until everyone has been driven out to New Mexico for the first days shooting. Then, we warned you about the Daily Express, but you didn’t listen, because the Daily Express is barely even a newspaper nowadays. Then we warned you about the Sun, but you didn’t listen, because it’s quite snobbish to moan about a working class paper. We warned you about the myth of political correctness, but you didn’t listen because ha-ha it’s the sort of thing that people like us have a bee in our bonnet about. We warned you about Katie Hopkins, but you didn’t listen, because the Apprentice is only a silly reality TV show and she obviously doesn’t believe a word of it. We warned you about Melanie Phillips, but you didn’t listen, because she was obviously mental. We warned you that that Anders Breivik used the “writings” of Melanie Phillips to justify murder, but you didn’t listen, because it’s not a journalists fault if a criminal borrows their words. We warned you about Gamergate, and you didn’t listen because it was only some little boys throwing their toys out of the pram over computer games. We warned you about the Sad Puppies, and you didn’t listen, because if this stuff bothers us so much we should damn well stay off twitter. Then a fascist became president of the USA, and you all said "Why didn't anyone warn us?" To take your mind off what is happening in the world today, here is me saying one of my favourite poems out loud.